I have not written about the League because it has been over two years since we last met. Then last week I received an e-mail for a “pop up” meeting of the group to be held at Barbounia Restaurant on Park Ave South in NYC. The message also suggested that we dig deep into our cellars and bring our best wines. Six of us attended and the wines were fantastic. The food at Barbounia was very good. I believe they may make the best thin pizza (Roman style) in NYC. 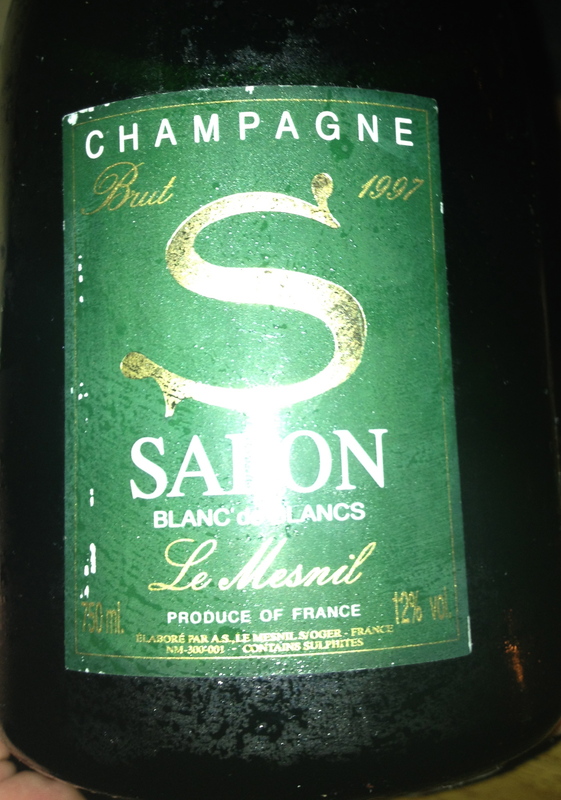 Champagne Salon Brut “Le Mesnil 1997– vintage blanc de blanc, prestige cuvee in Le Mesnil-sur-Oger 100% Chardonnay. The grapes come from 100% rated village (Grand Cru). This is all they produce. In his book “Champagne for Dummies,” Ed Mc Carthy says the following: “this is a massive, complex champagne that uses almost no dosage, but tastes so rich that you do not miss the dosage. With age it takes on aromas of walnuts, honey, vanilla and coffee. It is a superb example of the grapes of the Le Mesnil-sur-Oger, the greatest Chardonnay village in Champagne. It can age for a very long time.” Ed is right on the money! 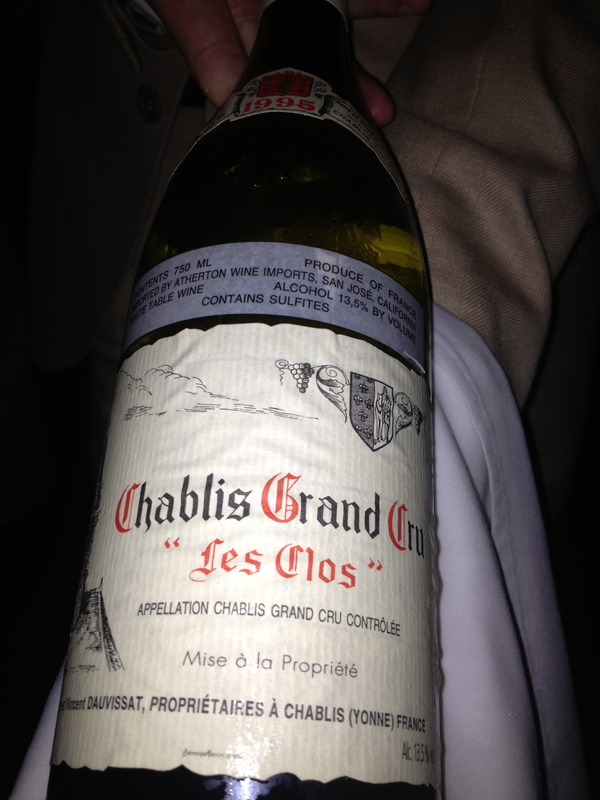 Chablis Grand Cru “Les Clos” 1995 Dauvissat 100% Chardonnay. This is my favorite producer of Chablis and it was everything and more than one would expect from Chablis. 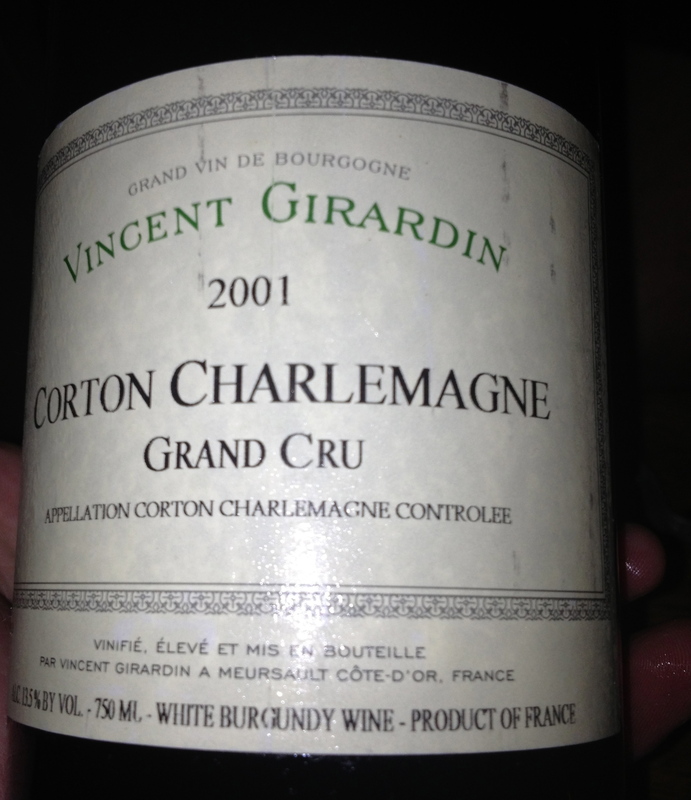 Corton Charlemagne 1994 Vincent Girardin 100%. Chardonnay The grapes are harvested by hand and are sorted twice-when picking the grapes and on the sorting table.There is a light pressing to get a slow extraction. After a gentle racking of the must, the wine is put in French oak casks (between 10 and 35% of new oak depending upon the appellation) The primary and malolactic fermentations can then begin with wild yeasts, which are on the grape berries. The aging is long on fine lees, between 14 and 20 months(depending on the “cuvees”). They follow the lunar calendar for bottling. 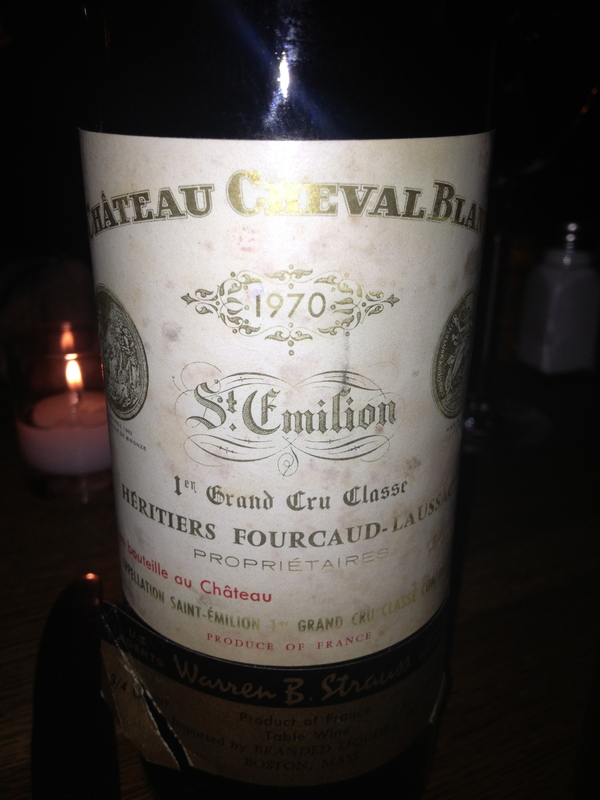 Chateau Cheval Blanc 1970 St. Emilion 66% Cabernet Franc, 33% Merlot and 1% Malbec. Chateau L’Angèus 1966 St. Emilion 60% Cabernet Franc and 40% Merlot. Both of the Bordeaux wines were in excellent condition. There was a discussion as to which one was drinking better and it was a split decision. Côte- Rôte 1994 “Côte- Brune” Gentaz- Dervieux Syrah with a tiny addition of Viognier. This is a wine I have only had once before. It is a traditional classic style Côte-Roti. The vines are 100 years old and there is fewer than 2 hectares of vines. The wine is aged in old oak barrels. It is a complex wine with hints of cherry, a touch of apricot, a mineral and savory component and it needs more time to develop. I was very impressed with this wine. 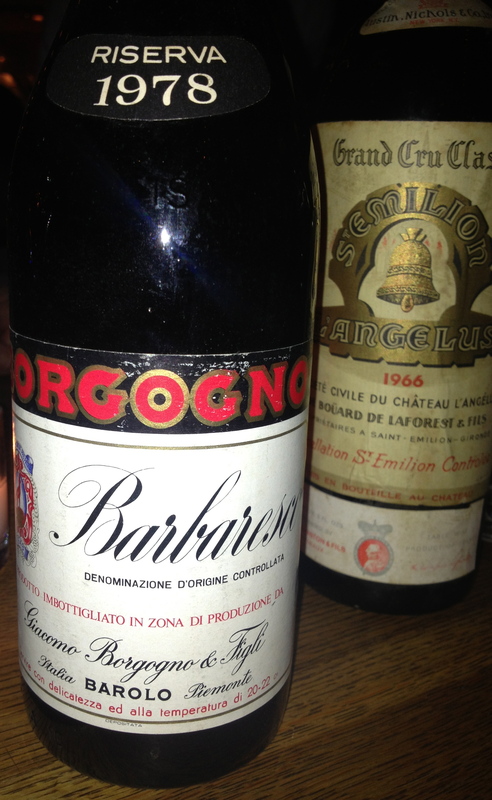 Barbaresco Riserva 1978 Borgogno 100% Nebbiolo. Borgogno is noted for their Barolo but they also make an excellent Barbaresco. 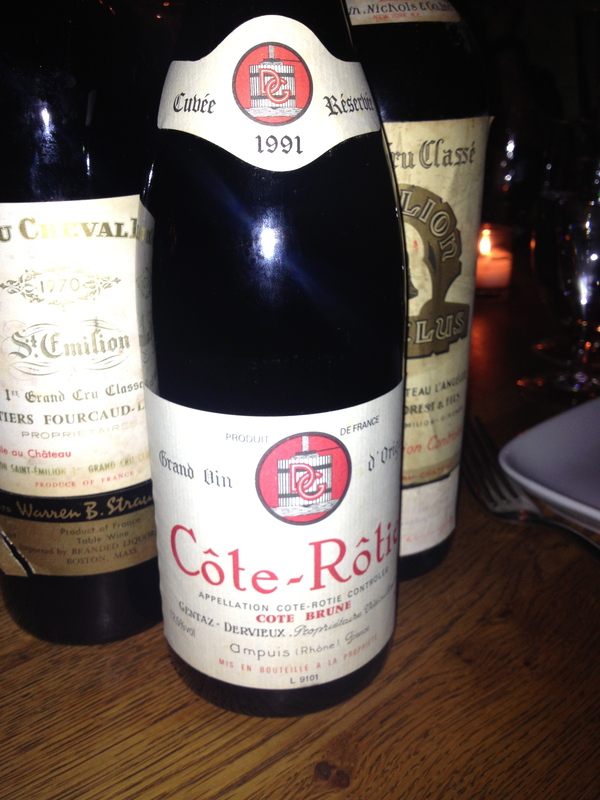 1978 was an outstanding vintage. This Barbaresco is drinking very well now and is at its peak. Domaine de Trevallon 1994. Made from Cabernet Sauvignon and Syrah. I have never had this wine before but really enjoyed it. The winery is located in Saint-Etienne du Grès in the Bouches du Rhone. They use no pesticides or insecticides, only sheep manure. The use of close pruning methods reduces the yield and prolongs the life of the vine from 20 to 50 years. They believe that it is best to do as little as possible in the cellar, no use of exogenous yeasts and no corrections for acidity. 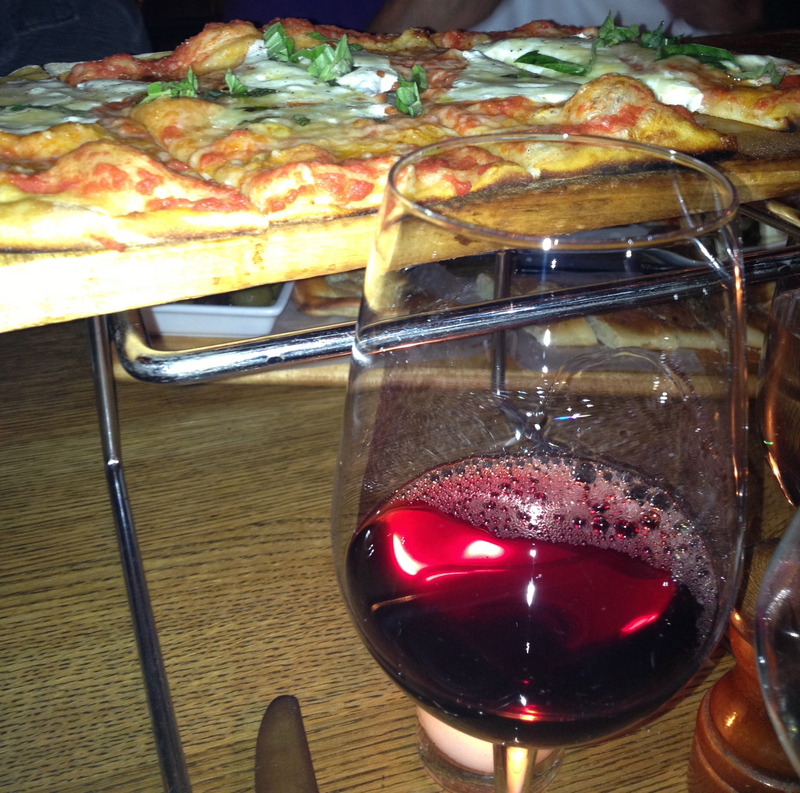 The whole process is completely natural, either by punch over by foot, or pump over to aerate the wine. The wine is aged for two years in oak.